An article that I contributed to a newsletter for the Coulee Region Herbal Institute. While we are past the season for fresh berries these recipes can also be created with dried or frozen berries you have tucked away. The season of elderberries is upon us. The Elder Tree overflows with dark purple black berries throughout the country: alongside roads & farm fields, and near rivers and wet ground. Elderberries are a favorite winter remedy rich with tradition and new found possibilities. The raw seeds of all Sambucus species can cause nausea but luckily these effects are destroyed by cooking (or by straining out the berries from a tincture or tea). Elderberries that are purple/black that ripen in the fall are the ones I am most familiar with and whose attributes this article speak of. The North American red berried elder (S. racemosa) which has berries in mid-summer, reportedly contains the most of the resin that causes the tummy upset and is not widely used. 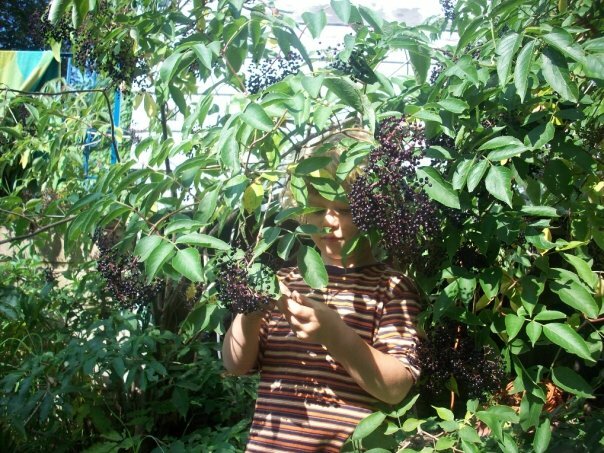 Harvest elderberries when they are ripe and purple-black but still firm and shiny. Strip the berries from the stems to process. Elderberries can be dried, froze, juiced or made into tinctures, syrups, wine, jelly, herbal vinegar or elixirs to last the winter through. Ideas abound on the internet and in herb books. Elderberries combine well with apples & grapes to make the harvest stretch. Put about ½ cup dry elderberries in a quart jar and cover overnight with just boiled water. Strain berries and enjoy. Cover fresh, slightly mashed berries with honey and let it infuse for a few weeks. Strain the berries and add the honey to tea or eat by the spoonful. Put ripe elderberries in a saucepan with half their volume of water. Simmer and stir for about 20 minutes. Allow to cool and then squeeze out the juice using a jelly bag. Measure the juice and for every pint of juice add half pound honey, a stick of cinnamon, a few cloves, slice of lemon or ?? Simmer for 20 minutes, then strain and pour into hot sterilized bottles. Fill a pint mason jar about half way with freshly dried elderberries. Other herbs or spices can be added in the jar at this point such as ginger, rose hips, cinnamon…Fill the jar half way with honey and then fill to the top with brandy. Shake or stir and decent in 6 weeks. Take a teaspoon as needed when feeling a cold or the flu coming on. “Almost from time immemorial, a ‘Rob’ (a vegetable juice thickened by heat) has been made from the juice of Elderberries simmered and thickened with sugar, forming an invaluable cordial for colds and coughs, but only of late years has science proved that Elderberries furnish Viburnic acid, which induces perspiration, and is especially useful in cases of bronchitis and similar troubles. To make Elderberry Rob, 5 lb. of fresh ripe, crushed berries are simmered with 1 lb. of loaf sugar and the juice evaporated to the thickness of honey. It is cordial, aperient and diuretic. One or two tablespoonfuls mixed with a tumblerful of hot water, taken at night, promotes perspiration and is demulcent to the chest. The Rob when made can be bottled and stored for the winter”. Bruton-Seal, Seal Julie & Matthew. Backyard Medicine Harvest & Make Your Own Herbal Remedies Sykhorse 2009, pgs 57-61.